, Palace and Park of Versailles, and even Half Moon Island (with the penguins!) in Antarctica. Starting today, you can view Iraq’s National Museum in Baghdad on Google Maps, in our Street View Gallery and on the museum’s own website. 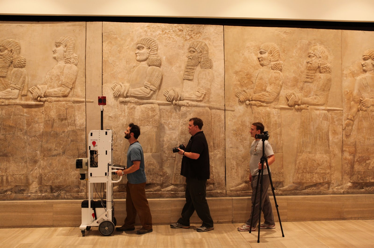 The project began in October 2009, when the Street View team had the opportunity to visit Baghdad to collaborate with the museum. By this time, the Iraqi National Museum had recovered a slew of articles that were infamously looted during the US invasion of Iraq in 2003. The collection hosts a staggering wealth of artifacts dating back to some of the earliest human settlements, which developed around present day Iraq. The history of this area is often underrepresented, or otherwise inaccessible, in large part due to the political strife that has plagued Iraq. For this reason, we considered it an important opportunity to showcase Iraq’s National Museum in our Street View Gallery. 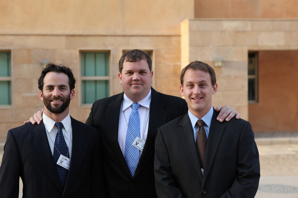 Dan Ratner, Matt Williams and myself in front of the museum. This was our first attempt to capture an indoor collection at a museum, and we met a host of logistical and technical challenges. While we already had Street View cars visiting cultural landmarks, taking panoramic photos indoors was an untested idea. We had recently completed a prototype of our indoor trolley - which was later used and refined for the Google Art Project, but we were unsure that it would perform how we had envisioned on-site. For security reasons, we could only spend 4 consecutive hours at the museum per visit. This meant our time there was frantic. We spent most of our first trip assembling and testing the Street View Trolley, installing car batteries that had been hastily acquired in Baghdad, testing GPS antennas, and making numerous satellite phone calls to our Mountain View headquarters to debug issues. While some of us worked on setting up the Trolley, others were photographing everything possible in the museum, trying not to get distracted by artifacts dating back over 6000 years. With the Street View Trolley working, we spent our second visit collecting images of the main exhibit halls. 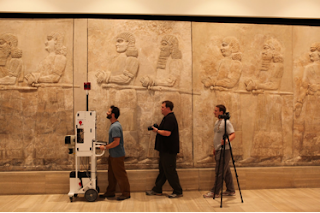 We also used high-resolution imaging equipment that enabled a close-up 360-degree view of individual artifacts, a selection of which are viewable on the Antiquities page of the Museum website. We imaged a Mother Goddess figurine that predates recorded history, cuneiform tablets that exemplify one of the earliest forms of writing, and several exquisite examples of early Middle Eastern pottery. 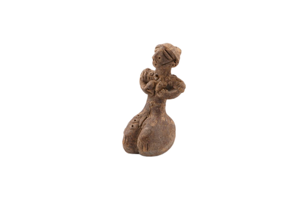 This piece, a clay figurine of a female from the Samarra period, was found at Tell Songor A. The 10.2 cm statue dates back to 5000 BC. Although we only spent a week in Baghdad, we returned with tens of thousands of still photos. We spent months processing the images - which includes stitching them into the immersive panoramic images you’re accustomed to when using Street View in Google Maps - and working closely with the National Museum to incorporate the imagery into their new website. At long last, we’re thrilled to jointly release the imagery, enabling users anywhere in the world to virtually visit the museum’s exhibit halls and learn more about Iraqi culture through this collection. For those whose interest is piqued by the collection and are considering visiting the museum in person, we hope these online images tides you over until the official museum reopening planned for later this year. You can experience the the Iraqi National Museum for yourself through our Street View feature in Google Maps, via our Street View Gallery, or take a virtual tour on the museum website. Over the years, our Street View technology has been used to showcase images from a variety of amazing locations around the world. Without the stress of travelling, we’ve all been able to tour places like Stonehenge, Palace and Park of Versailles, and even Half Moon Island (with the penguins!) in Antarctica. Starting today, you can view Iraq’s National Museum in Baghdad on Google Maps, in our Street View Gallery and on the museum’s own website.